Clean-Fit Products, a division of The Mill-Rose Company, has introduced Blue Monster® 1-Step PVC Cement, a new self-priming PVC pipe glue that requires no additional primer.at requires no additional primer. New Blue Monster 1-Step PVC cement simplifies installations and offers faster curing times. Clean-Fit Products, a division of The Mill-Rose Company, has introduced Blue Monster® 1-Step PVC Cement, a new self-priming PVC pipe glue that requires no additional primer. Blue Monster® 1-Step PVC Cement simplifies installations by reducing labor and offers faster curing times before pressure testing. Ideal for under-the-sink jobs and home remodels, Blue Monster PVC cement can be used on all classes of rigid and flexible PVC pressure pipe, including Sch. 80 (up to 6” in diameter), and 8” diameter on non-pressure PVC pipe. This new fast-set cement can be used in all weather conditions sealing wet or dry PVC pipe effectively. Typical uses include potable water, pressure pipe, pool, irrigation, conduit, DWV, drain duct and sewer. This is eco-friendly (low VOC), fast-set cement meets or exceeds ASTM Spec. D2564 and can be used without primer where acceptable by local codes. 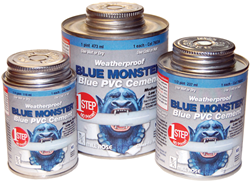 Blue Monster® 1-Step PVC cement is offered in 4-ounce, 8-ounce, 16 ounce and 32 ounce cans with an applicator designed into the container’s lid, and is available at leading wholesalers. Clean-Fit Products is a division of The Mill-Rose Company, the world's leading supplier of PTFE thread sealants and largest manufacturer of twisted-in-wire brushes in the U.S.A. For further information contact Clean-Fit Products, 7310 Corporate Blvd., Mentor, Ohio 44060. Telephone 1-800-321-3598, fax 1-440-255-1072, e-mail info(at)cleanfit(dot)com or visit the company's web site at http://www.cleanfit.com. Knudsen, Gardner & Howe, Inc.